The Wings of Glory Miniature Game – Giants of the Sky project on Kickstarter launches today. The goal is to release and add to the game two colossal WW1 bombers, the Handley-Page O/400 and Zeppelin Staaken R.VI. The campaign will run until April 2nd, with an initial funding goal of $20,000. The video trailer of the Kickstarter project can be seen below. 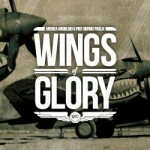 Wings of Glory is a tabletop game that recreates aerial combat during WWI and WWII, using cards and miniatures to represent the airplanes and their maneuvers. The game system includes game sets and additional packs with a great collection of pre-painted, ready-to-play model airplanes, and accessories. This is the first time we have used the crowdfunding platform for this game, which has already released 26 different WW1 period model airplanes. 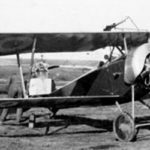 “The Handley-Page O/400 and the Zeppelin Staaken R.VI are two of the largest airplanes to fly during WW1 and it was a real engineering challenge. 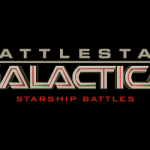 Their exceptional dimensions and complexity require more resources than our regular models,” said Roberto Di Meglio, Director of R&D of Ares Games. 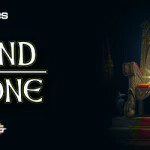 The crowdfunding project will help to gather these resources and it also helps promote the game and reach new players. 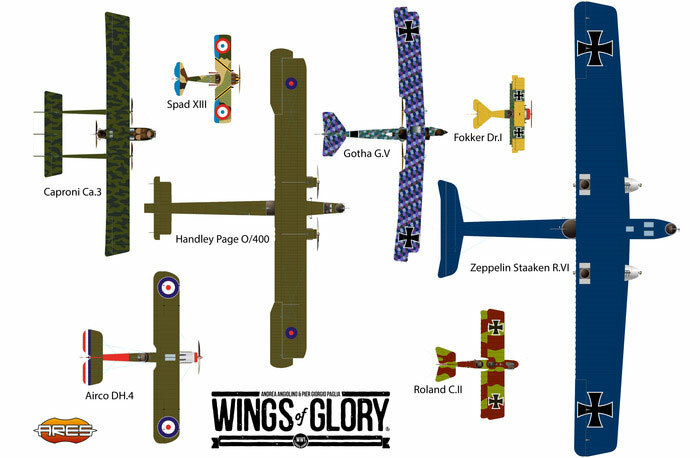 Each of these “Giants of the Sky” will be featured in Wings of Glory in two different versions. All the miniatures are painted and assembled, complete with special gaming base, maneuver deck, airplane card, management card, counters and rules. 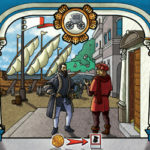 To support the project on Kickstarter, backers can choose among ten pledge levels. Rookie ($49) – Targeted for new players, this pledge level includes everything needed to start playing Wings of Glory: the WW1 Rules and Accessories Pack and a selection of four of the best models available in the game range (the Fokker Dr.I, Albatros D.V, Sopwith Camel, and Spad XIII). It can be combined with the other pledge levels to include one or more of the new bombers. 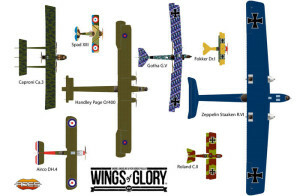 Handley-Page O/400 and Staaken R.VI with other models of WW1 Wings of Glory range. Entente Player ($50) - includes one 1/144 Handley Page O/400. Central Powers Player ($70) - includes one Zeppelin Staaken R.VI. Veteran ($110) - the option for players who want both models, offering one Handley-Page O/800 and one Staaken R.VI. Collector ($200) - offers four models - both bombers in their two versions. 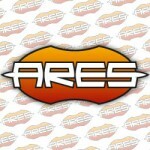 Retailers ($800) – an exclusive pledge level that grants special pricing for hobby games retailers. It offers twelve 1/144 Zeppelin Staaken R.VI and twelve 1/144 Handley Page O/400 miniatures (six of each versions for both models), as well as access to all the stretch goals of regular backers. For Veteran and Collector levels, there will be "Day One" Early Bird pledges available for 24 hours after the launch of the project, offering a small additional discount as a “thank you” to the initial supporters. The rewards of the Rookie Pledge Level will ship immediately after the end of the Kickstarter, while the new models are expected to deliver in October 2015. The rewards of this Kickstarter project will not include exclusive miniatures, as these models will become a permanent part of the game, and we want all players to be able to purchase them through normal distribution after the Kickstarter delivery. To thank the backers, the Kickstarter version of these airplanes will have unique packaging – different from the normal edition – including a "Limited Edition" certificate with each plane. Depending on the success of the project, one or more additional items may be included in this version. 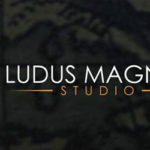 A number of stretch goals to enhance the gameplay experience are planned for the campaign, including special mission and game mats related to the models presented; accessories such as deluxe laser-cut rulers and acrylic counters (developed by our partners at Wings of Glory Aerodrome); and more. The Wings of Glory Miniature Game – Giants of the Sky project on Kickstarter is EU-friendly. There will be no duty or taxes to pay for backers living within the EU. Shipping to any destination in the Continental USA free of charge, and for other countries, there will be shipping variable charges from $15 (European Union or Canada) to $29 (anywhere else). 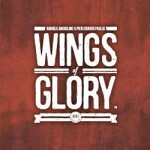 Wings of Glory Miniature Game – Giants of the Sky will run until April 2nd. For more information and to pledge, visit the project’s page on Kickstarter.